We’re smitten with the creative DIY masterpieces that designer dad Joel, of Made by Joel whips up for his adorable kids. Above, doll house furniture fashioned with hand printed fabric scrap embellishments, wire for the chair, a swatch of faux fur from a household rug, and a twig from the backyard for the whimsical indoor tree… when can we move in? Ohdeedoh unearths vintage treasures on Etsy — classic childhood toys from yesteryear that never get old. se7en blog shows us how to make a vibrant and rollicking rocket in seven steps using trusty design sidekick, the cardboard box. We're smitten with the creative DIY masterpieces that designer dad Joel, of Made by Joel whips up for his adorable kids. 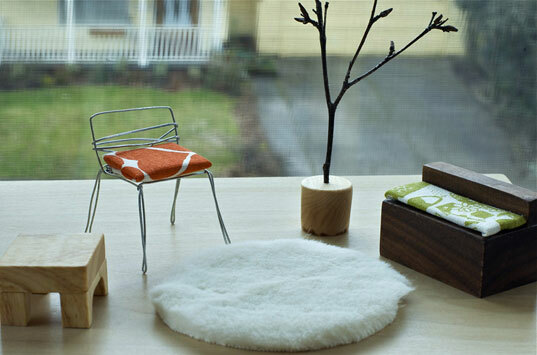 Above, doll house furniture fashioned with hand printed fabric scrap embellishments, wire for the chair, a swatch of faux fur from a household rug, and a twig from the backyard for the whimsical indoor tree... when can we move in?